You've collaborated on the storyboards, you've charmed on the conference call, you've nailed the pitch, and now you've won the job! It's Monday morning, and for once you're actually looking forward to making the harrowing commute...Starbucks is pulsing through your veins and you're ready - no you're stoked - to embark on that big-brand TV shoot. And then your phone interrupts your pump-up music on the BPM channel. Your apologetic producer is on the line and gently breaks the news: you don't have the money in the budget for that gorgeous steadicam shot you built into the boards. The steadicam shot that left you so inspired to direct this project in the first place. The buttery smooth eye-pleasing delicacy you were going to build your reel around. 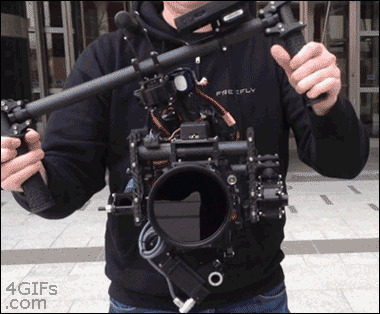 Or you could try MōVI. For a recent television commercial campaign I directed for a liberal arts college in Georgia, this is the exact scenario that crashed my world, minus a few of the dramatic embellishments of course. Well maybe not of course, I'm a director, we're dramatic gall darn it. But back to first person - you (we) may have a flair for the dramatic, but when you're experienced, you're also pragmatic. And if the MōVI is anything, it's pragmatic. Here are some snippets of MōVI shots from our shoot, these shots have not yet been steadied in post, which we found can help make your steadicam shots even smoother. Another maneuver MōVI allows you to perform: changing directions or doing a "handoff" where two operators complete a complex move, such as through an opening. Basically a gimbal and a set of gyros used on aerial camera mounts, but formulated with carbon fiber handles, bringing stabilized moves of a full-fledged steadicam into the hands of your favorite partner DP. When we rented the gear from Chicago's Magnanimous Media Rental House, the MōVI had only been out for a few weeks, and the reluctant rep wanted to make sure we had time to prep. We used the MōVI M10, which maxes out at 10lbs for the camera. Luckily we flew into Atlanta and had the rest of the day and night to set the rig up with the Canon EOS C300 camera, which tipped the scales right at the top-end of the acceptable weight for the M10. You'll want to have plenty of time to balance your camera of choice with the MōVI, and make sure you check the weight of your camera with the appropriate model. The MōVI may not be the right system for your needs if you've got a big-time sequence to nail and you need rock-solid, experienced steadicam operators to make sure your AD isn't in your ear about keeping the schedule moving. Or maybe just the spelling of the MōVI, with it's cute little spelling flourish, turns you off. But for many producers, directors, and DPs, the MōVI can put an entirely new realm of possiblity into your creative trick bag. Here are the finished :30 Spots I Directed for the collegiate television campaign, enjoy and scroll down below to see some additional behind-scenes pics. Jeremy Pinckert is a Director of TV Ads, Campaigns, Web Videos and Branded Content. His work for Explore Media has won Tellys, Best in Show ADDYs, and an Emmy Award. You can see him on LinkedIN, and check out his video portfolio reel.